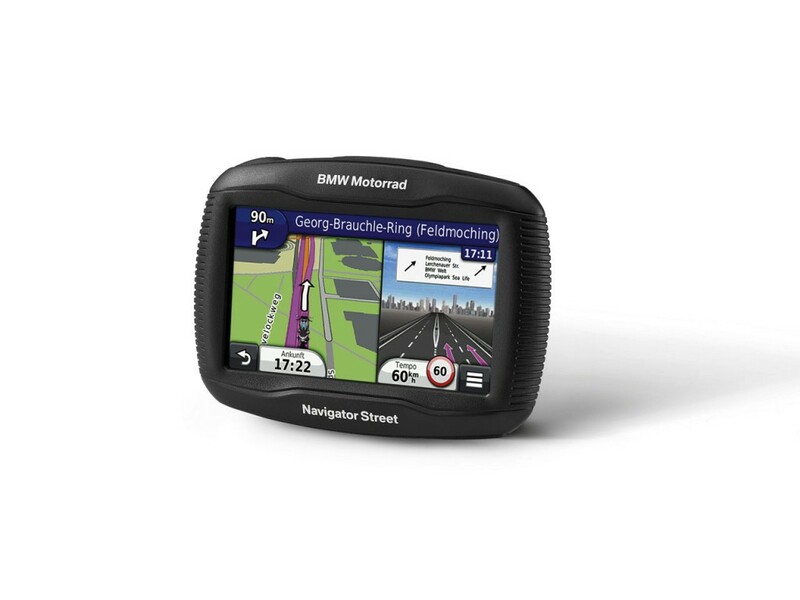 Official Release: With the new Navigator Street, BMW Motorrad is offering an inexpensive entry-level navigation system for BMW motorcycles without navigation preparation option. The new Navigator Street supplements the existing BMW Motorrad Navigator, which will remain part of the product range. The Navigator Street features a large and bright 4.3″ touchscreen which can be operated reliably with gloves and is also well readable in direct sunlight. The bluetooth capable GPS navigation system can transmit navigation instructions directly to the helmet and allows the rider to make outgoing calls and accept incoming ones while riding using the handsfree function. For example the rider can call a POI (Point of Interest) directly (only in conjunction with the communication system). The navigation system is delivered with pre-installed maps of Europe or North America (only available in North America and Canada). Apart from free life-long map updates, the rider can plan his routes individually and comfortably on a PC using the BaseCamp tour planning program available as a free download from www.garmin.com/basecamp. 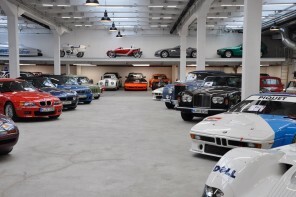 The Navigator Street has a storage capacity of 8 GB. This can be expanded using an additional SD card slot. The Trip Technology implemented in the Navigator Street using Via and Shaping Points for route planning and guidance enables the rider to plan long and detailed motorcycle tours. Shaping Points are used to set up the route, without being announced as interim destinations during navigation. Up to 150 Shaping Points between 2 Via Points are possible (these can only be set up in BaseCamp on the PC, not on the navigation device itself). With the “Winding Road” routing option, the Navigator Street calculates the route with the most curves. Special navigation extras of the BMW Motorrad Navigator Street include the 3D intersection view with lane change assistant as well as the TracBack function. The 3D intersection view shown in the split-screen provides optimum orientation at complex intersections and junctions and the TracBack function permits returning to the starting point along the same route. In addition the SKIP function allows the rider to skip waypoints and the motorway POIs provide information about fuel stations and restaurants for the next exit. Motorcycles tours can be recorded and transmitted free of charge using Garmin Adventures (supported by BaseCamp). BaseCamp can be used to combine waypoints, photos with geo-tags, YouTube videos and more and transmit them online. Garmin Adventures also allows users to rate routes, read reviews and download routes created by other riders. 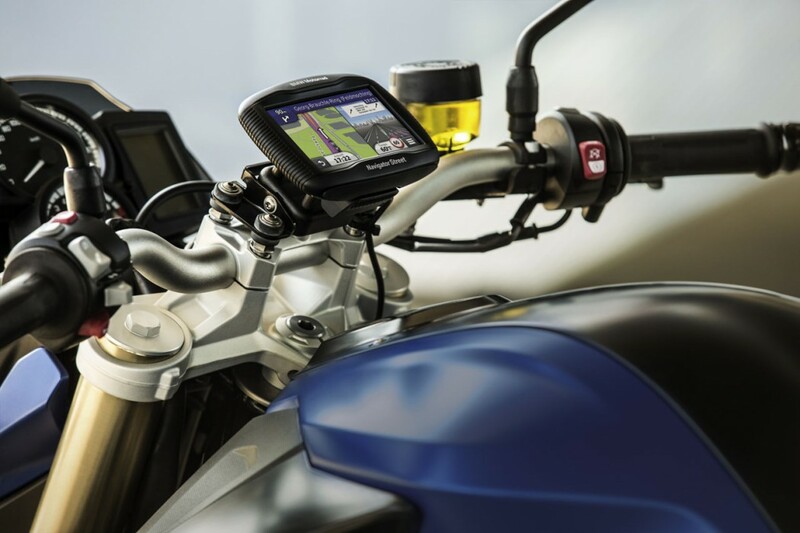 The Mount Cradle supplied with the navigation system can be used to attach the Navigator Street securely to all BMW motorcycles which are not fitted with the optional navigation preparation feature ex works. 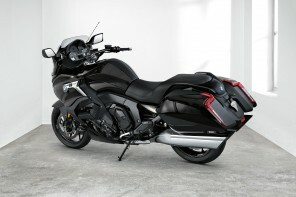 It has been designed to fit all known motorcycle specific holders by BMW Motorrad (not included), it features a 12 V connection cable for connecting it to the optional accessory connector for use with the motorcycle’s electrical system to provide power for the Navigator Street.